Oh boot camp, how I do not miss thee. While technically I went to Marine OCS (Officer Candidate School, or in simple terms: boot camp), it’s not something I would really want to do again. For those guys who tragically got hurt at OCS – fractured bones was the most common from the constant running/hikes – they got the chance to start all over again, which makes them even more impressive. Would you want to do boot camp 1.5 or 2 times? I would – but I would be one grumpy mother trucker in my second go-through. 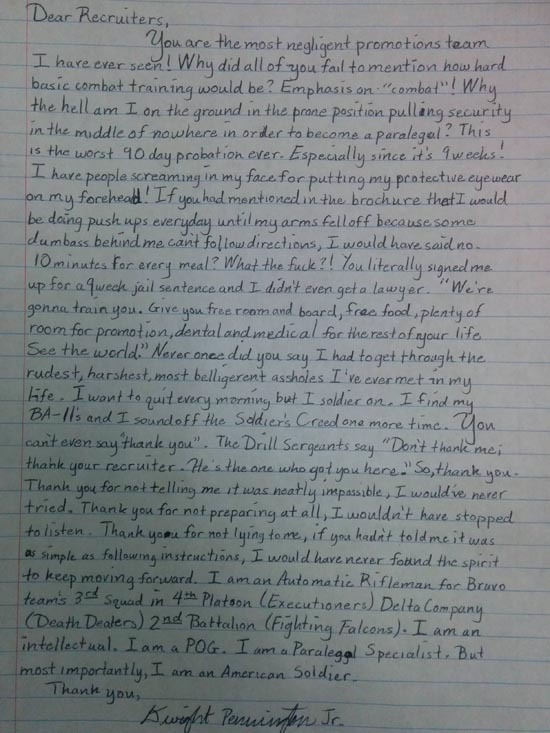 Alright enough with the nostalgia: what I have here for you in preview picture form above, and full picture form below, is arguably – no probably the funniest boot camp letter I have ever read. It is also ironically maybe the most coherent and intelligent, but then again, it’s not really that surprising because it came via the frustrated pen of a paralegal specialist! What’s a paralegal specialist in the Army, you ask? He/she is pretty much the tip of the spear on the front lines. /sarcasm. Full boot camp letter below! Alright so before I start dropping spoilers like it’s cool, you just need to read this thing from start to finish on your own – I don’t need ya’ll writing me any nasty letters telling me how awesome I am. Told you it was awesome! Although his name is somewhat hard to read – which is weird because he may have the best penmanship in the world for not being a second grade teacher – it appears to be “Dwight Pennington Jr.” Well Mr. Pennington – if you actually exist and this isn’t just a spoof (in all honesty I don’t even care – it made me really laugh pretty hard) – I think you have a career in comedic writing waiting for you down the road after your military paralegal career comes to a close. Saturday Night Live, perhaps? Heck, how about a new funny military movie: outside of Stripes and Tropic Thunder, it is really slim pickings. If anyone can drum up a funnier boot camp story from their time in boot, or is able to scrounge one up form the dearths of the Interweb, drop us a line about it and a link below in the comments! More content coming ASAP – stay classy SQ! /Image credit goes to Reddit user and actual Army recruiter “seetully“; props for sharing this epic boot camp story! I’m callin fake, but it’s still pretty funny. No way you can write that neatly and not know what boot camp would be like. I read this article on SQ and found it very interesting, thought it might be something for you. The article is called Probably the Funniest Boot Camp Letter Everand is located athttps://www.slightlyqualified.com/probably-the-funniest-boot-camp-letter-ever.